The following versions of Office have been fully tested and are supported on Windows 10. They will still be installed on your computer after the upgrade to Windows 10 is complete. Office 2007 (Version 12) is no longer part of mainstream support and hasn't been tested on Windows 10. However, Office 2007 will install and run on Windows 10. Versions of Office prior to Office 2007 are no longer supported and may not work on Windows 10. To see options for upgrading to the latest version of Office, see Choose your Office. For peace of mind, we recommend that before you upgrade to Windows 10 you use the Get Windows 10 app to do a compatibility check. Many devices already have the app installed through updates. 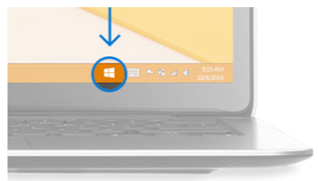 To see if you already have the app, look for the Windows icon on the far-right side of your taskbar. If you see it, select it to get started.